The first hedgehog I ever met was Mrs. Tiggy-Winkle, Beatrix Potter’s kindly washerwoman of the Lake District. From her tiny country cottage to her “little black nose [that] went sniffle, sniffle, snuffle, and her eyes [that] went twinkle, twinkle”, she was everything I thought charming and good as a child. Since then I have always felt a love and affinity for hedgehogs. But not until I sat down to write this story did I actually realize that Mrs. Tiggy-Winkle was not only the first hedgehog I ever met, she is the only hedgehog I’ve ever met. You see, I’ve always vaguely imagined that hedgehogs were all around me, hiding in burrows and hollow logs and hedgehog-sized cottages, but a quick look into the matter has thoroughly disavowed me of my silly assumptions. Hedgehogs don’t even live in the United States, let alone outside my window! They live most everywhere else, but not here. I’m sure this doesn’t surprise our worldly readers, but to me this information was a little bit shattering. 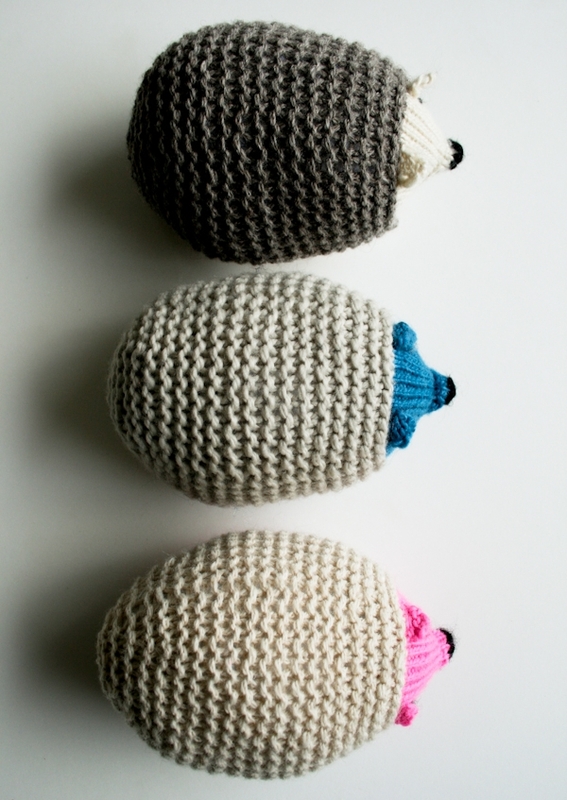 This newfound knowledge only makes my trio of Knit Hedgehogs more germane, because now they’re not just cute and adorable, but they also offer a very practical way to hang out with hedgehogs if you happen to live in the Americas! England is one place hedgehogs do live (just ask Beatrix Potter! 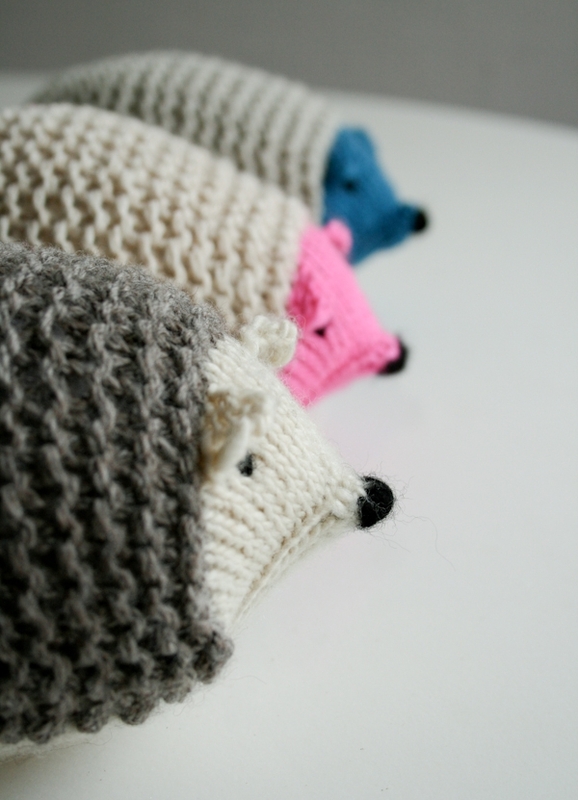 ), and so for a truly native hedgehog, we turn to British crafter Julie Williams of Little Cotton Rabbits. Just before posting this story, Little Cotton Rabbit’s equally adorable Little Oddment Hedgie was pinned to our Pinterest page. We love it! 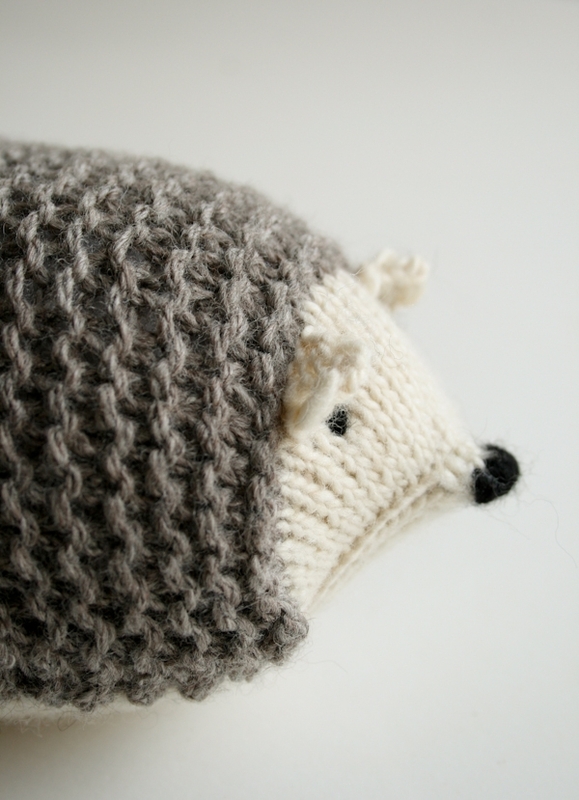 For our hedgie I used Manos del Uruguay’s pretty Silk Blend for its head and belly. With a gentle handspun shine, Silk Blend makes a lovely contrast to the Cascade yarns I used for the hedgehog’s garter stitch back. Both Eco Cloud and Superwash 128 are great heavy worsted weight choices for cuddling! 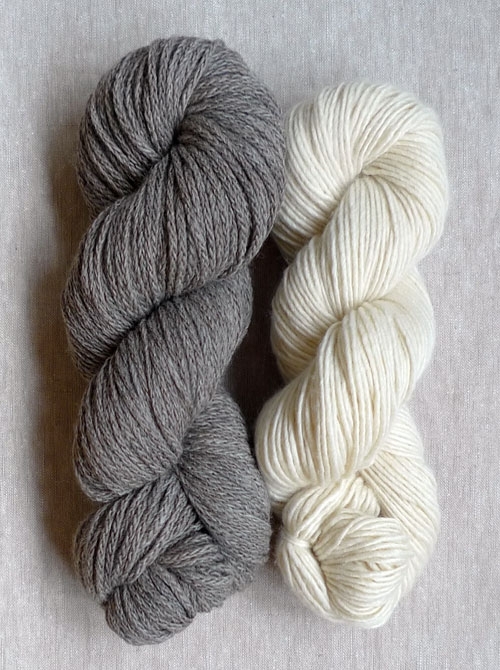 1 skein of Main Yarn, shown on left: Cascade’s Eco Cloud, 70% Undyed Merino Wool and 30% Undyed Baby Alpaca. This color is Ecru. 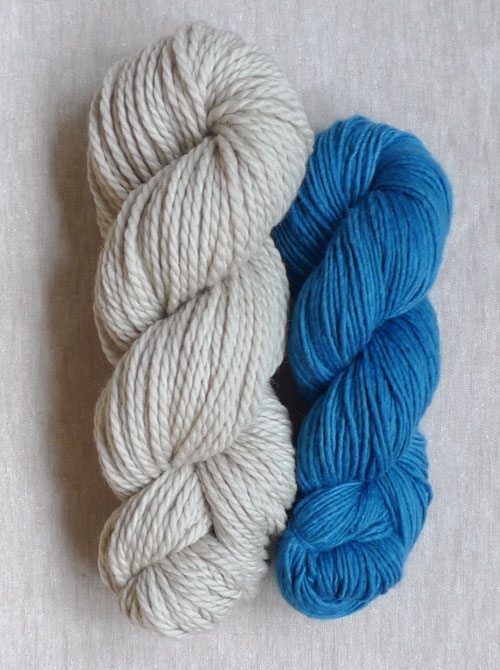 1 skein of Contrast Yarn, shown on right: Manos del Uruguay’s Silk Blend, 70% Merino Extrafine Wool and 30% Silk. This color is Shocking. 1 skein of Main Yarn, shown on left: Cascade’s Eco Cloud, 70% Undyed Merino Wool and 30% Undyed Baby Alpaca. This color is Wild Dove. 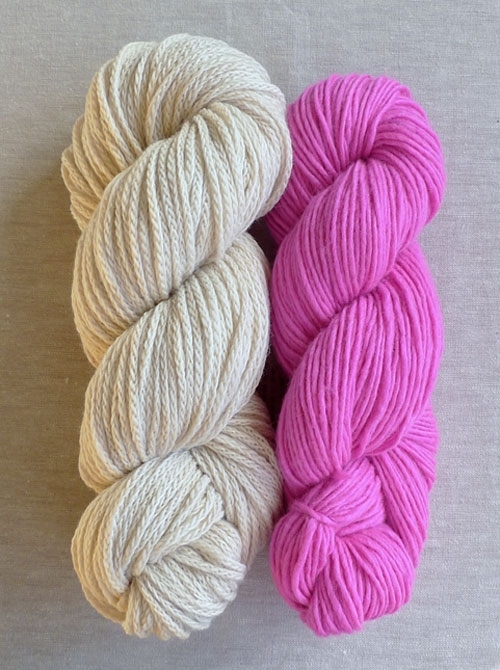 1 skein of Contrast Yarn, shown on right: Manos del Uruguay’s Silk Blend, 70% Merino Extrafine Wool and 30% Silk. This color is Natural. 1 skein of Main Yarn, shown on left: Cascade’s 128 Superwash, 100% Superwash Merino. This color is Feather Grey. 1 skein of Contrast Yarn, shown on right: Manos del Uruguay’s Silk Blend, 70% Merino Extrafine Wool and 30% Silk. This color is Juniper. Scrap yarn in a heavy worsted or chunky weight for the eyes and nose. I used Purl Soho’s Super Soft Merino in Soft Black. With the Contrast Yarn and the smaller double pointed needles, cast 6 stitches onto three needles. Repeat Round 5 until there are a total of 36 stitches. Arrange the stitches so that the first 7 stitches of the round are on one needle and the remaining 29 stitches are distributed between the second and third needles. NOTE: For this section you will just be working back and forth on the first 7 stitches. Cut the yarn. The 5 Belly stitches remaining on the double pointed needle will be on hold until the end of the next section. NOTE: For this section you will be working back and forth on the 29 Head stitches that have been on hold. With the right side facing you and using the Main Yarn and the larger double pointed needles, knit 29 stitches onto three needles. Here’s how to pick up purlwise: start with the yarn in front like you’re going to purl, bring the right needle from the right side of the fabric to the wrong side, wrap the yarn as if to purl, then bring the stitch out to the right side. Repeat Rows 1 and 2 until all the Belly’s edge stitches have been picked up and you have reached the 5 stitches on hold. End with a wrong side row. Now is a good time to turn your hedgehog inside out so you can weave in the ends. Then turn it right side out and fill it with stuffing, making it nice and chubby. Cut the yarn and thread it through the remaining stitches. Then thread the tail through the hedgehog so it comes out somewhere else and cut the tail. With the smaller double pointed needles, the Contrast Yarn and the nose facing you, pick up 4 stitches from the top of the head where it meets the body. Pick up off to the right side, where an ear might be. Row 1 (wrong side): Purl. Row 2 (right side): Knit. Cut yarn and pull it through the remaining stitch. Now make a left ear just the way you made the right one! Thread some scrap yarn onto a tapestry needle. Poke the needle into the body of the hedgehog and bring the needle out under an ear, right where you’d like an eye. Now insert the needle one stitch away from where it came out, and bring the needle out under the other ear. Again, insert the needle one stitch away from where it came out, and now bring the needle out at the top of the nose. Make four vertical stitches over the tip of the nose, then poke the needle out of the body somewhere. Cut the tails, plump up your new friend and you’re done! I'm a french woman but i don't understand the pattern !! do you belong to Ravelry.com? They will help you to understand the English. We don't speak French so unfortunately we can't be of much help! Sorry! 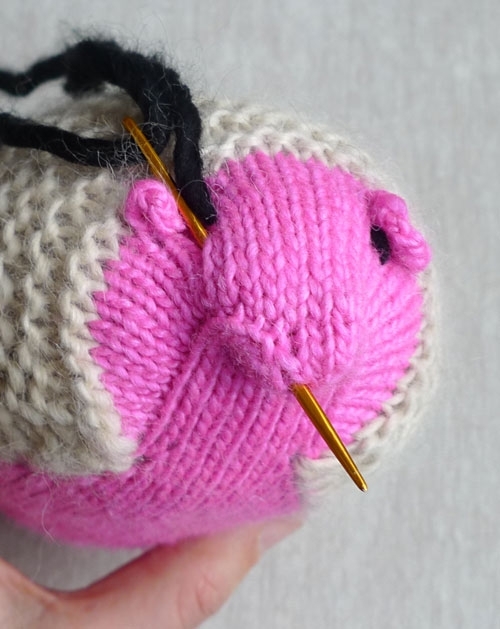 I think you would run into a couple of spots where you'd need a set of double pointed needles, most notably, at the beginning when you knit the head. For most of the body, however, you should be fine with very short circular needles! If you cast on with Judy’s Magic Cast On or a bellybutton / disappearing loop cast on (which are neatest anyway) circs with an average and flexible cable will do magic loop for this pattern perfectly. If you have interchangeables it’s even easier because you can leave the first 7 stitches on the needle, unscrew the cable and screw end caps on the cable. That way the 28 stitches are more secure and you can screw a shorter cable on the tip for the belly. Hi I think the hedgehogs are sooooo cute. But am wanting to know is the wool used for his back Double Knit or thicker please. Emailing from New Zealand. The yarn used for the back is a heavy worsted which is a bit thicker than Double Knit weight yarn. Thank you! 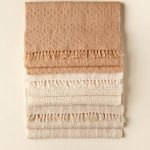 I live in South Africa and can't buy this wool here; what weight is it so I can find a substitute? I clicked on the link and unfortunately it doesn't list the wool weight either. Just make sure you are getting the proper gauge before you start! The gauge is listed under "The Pattern" headline. Very cute pattern and working on my first stuffed toy! I was a little confused with the start of the belly section. It says to put the first 7 stitches of the round on one needle, but the pictures shows the last 7 stitches on one needle. The following instructions for working back and forth on those stitches has the first 7 stitches on one needle. Am I just looking at the picture wrong? Because the finished belly also looks like it's made from the stitches in the picture, so I'm not sure how to arrange my stitches. Just let me know. I think in the picture it kind of looks like the working yarn is coming from the front needle, but really it's coming from the back needle. So, you should follow the pattern which says to put the first 7 stitches onto one needle and to work just those 7 stitches for the Belly section. I'm sorry for the confusion. I hope this clears things up for you! Please let us know if you have any other questions and thank you so much for this one! As "knit to end of round" you mean that I m1t after the 10th stitch or between 9th and 10th? And if it is after how I will do it? I knit like this ? At this point we have 12 stitches. I didn't very well understood from which stitch we start count the first seven in the next round and if as and of round you mean the m1r of the previous round. Is this correct or I have to count as first or seven the last stitch after the m1r? Please forgive me for my mistakes as English is not my mother tongue. And thank you again, your site is awesome! You could try to change the pattern to increase the size of the hedgehog, but you may run into a few tricky moments! An easier approach may be use much bigger yarns, keeping them at the same proportions to each other as they are in this pattern, i.e. 7:5.5 stitches to the inch. 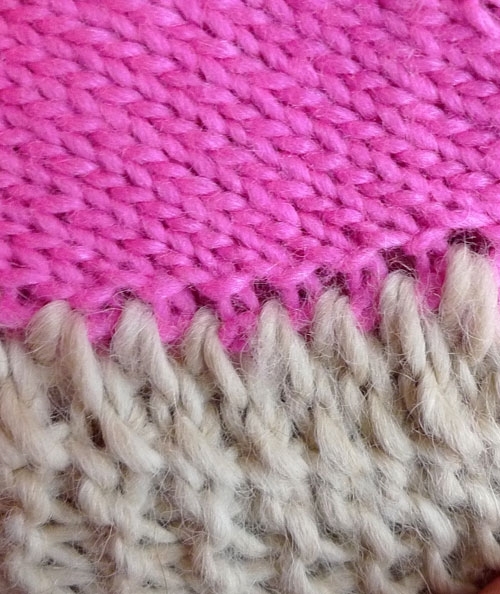 For Round 5, you should actually "make 1 right" after you knit the last stitch of the round. You do this the same way you would make 1 anywhere else in a pattern. Here's our video tutorial that reviews make 1 right and left: https://www.purlsoho.com/create/knitting-tutorials-increases/2013/8/13/make-one-right-m1r-make-one-left-m1l.html. And as far as continuing to repeat Round 5, your chart is correct except for the make 1 right happening before the last stitch instead of after. To clarify, you should always just knit the first 7 stitches of the round, then make 1 left, knit the remaining stitches in the round, make 1 right. I hope this helps improve the look of your next hedgie's head! Congratulations on having made the first one and thank you for your questions! Dear Witney, thank you for your quick answer. You are right, I can make the 1r the same way I can do it anywhere else because I knit circular… As a newbie this isn't obvious. Thank you again and many greetings from Greece! I love this hedgehog and am enjoying knitting it. The question that I have is in regards to picking up stitches around the belly. The directions say to pick up every other row and we can tell we're doing so when there are two vertical strands. When I try, not only am I not getting the two vertical strands, I am seeing some significant gaps between the picked up stitches. How do I avoid the gaps and get a nice seam like in your photos? Thanks! My guess is that you're having problems because you're sometimes picking up every row and sometimes every other row, or you're picking up sometimes right at the selvedge and sometimes a stitch or two away from the selvedge. Picking up stitches neatly (and confidently!) is a technique that seems to require a lot of practice and/or experience. The single most important tip I can give is to be consistent! Even if you don't pick up your stitches in exactly the same place I picked up my stitches, if you find a pick-up spot that makes sense to you and you do the same thing every time, you'll have a nice seam. I hope this helps! Thanks so much for your question and please let us know if you have any others! Thanks so much for this fun pattern! I loved making it and my hedgehog looks great resting on my fireplace hearth. So cute! Whitney, do you think it would to do the hedgehog's garter stitch back with two strands of the Anzula Sebastian yarn instead of the thicker yarns recommended? 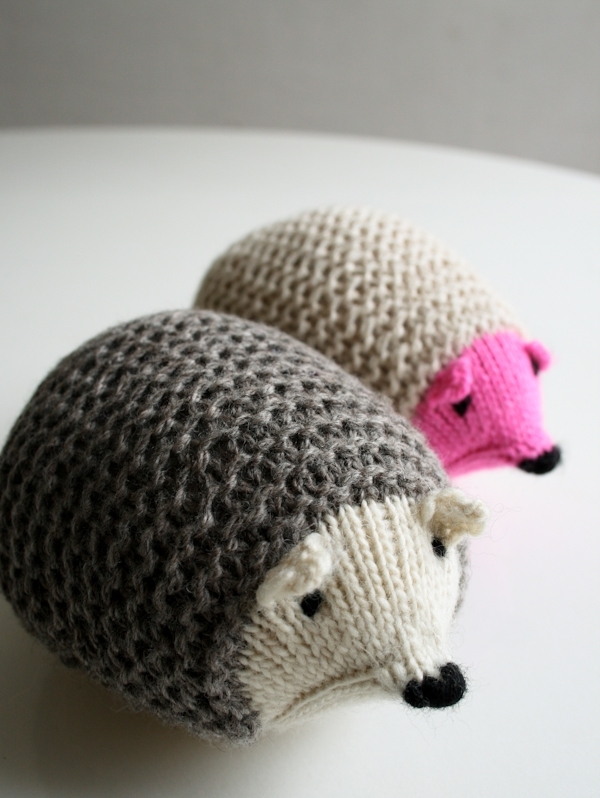 I have some extra Sebastian yarn from a different baby project and would love to use it up with a matching hedgehog! Hola, acabo de terminar el hermoso Erizo con cara Rosa fuerte y cerpo color natural qued hermoso, no habpia hecho un amigurumi con agujas aspi que me gust el proyecto, adems de lo bie explicado, espero encontrar otros animalitos, para poder hacerlos, Gracias por su pgina me ha gustado mucho, felicidades. desde Mxico, D. F.
Sure! As long as you're getting the same garter stitch gauge as the pattern you're all set; or, at least as long as the stockinette gauge and the garter stitch gauge are in the correct ratio to each other you're all set! Thanks for asking and please let us know if you have any other questions! Hello, I have my double pointed needles out and have started the nose over countless times. Are there any tricks to using double pointed needles with so few stitches? My needles are slipping all over the place and I lose track of the order in which the needles are supposed to go and by the time I get to round two, it is such a mess that the m1l is impossible… any tips? Thanks… I love these hedgehogs and am determined to succeed! Oh my goodness I had the same problem with the nose because I have never worked with so few stitches! I was using stainless steel needles and the stitches kept slipping off. Almost quit! I did eventually get the nose started. Not perfect but I kept on anyway. Now working on picking up the belly stitches. Hello, I would like to receive the explanations of the hedgehog in French. It would be really kind. I began but it is really very hard to understand(include). Thank you for the comment! Unfortunately we are unable to translate our patterns into other languages at this time. None of our blog staff are able to translate accurately enough for us to be sure it is correct. I apologize that I can’t be of more assistance. If you have any other questions about the pattern feel free to reply! love this pattern, I have a question regarding the start of the stronger yarn – do I pick up the knitting with “working in rounds” with 4 needles? Like in the beginning with the thinner yarn – or do I continue knitting like the end of the belly section with two needles back and forth, each of the three needles separately. I am sorry if this seems confusing, I just cannot get my head around “starting from the wrong side” and then working with the usual “rounds”… Thanks for the clarification. You knit the Body back and forth in rows (turning the work at the end of each row), like you did at the end of the Belly, only now you’re using three double pointed needles instead of two. I hope this clears things up for you and thanks for your question! I had a similar question regarding knitting back and forth on the three double pointed needles for the start of the body section. Does this require a fourth needle? You mention that it is similar to the belly, in that you turn the work around after each row; but, do we only use three needles at any given time, or do we need a fourth to begin knitting? 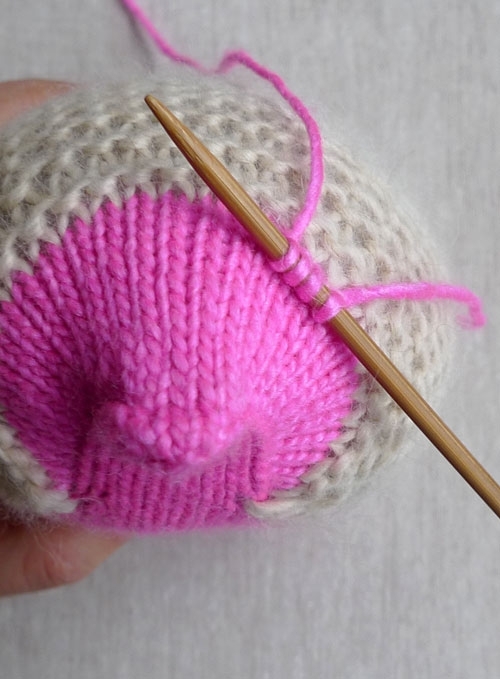 Does adding a forth needle make it knitting in the round? You’re correct! 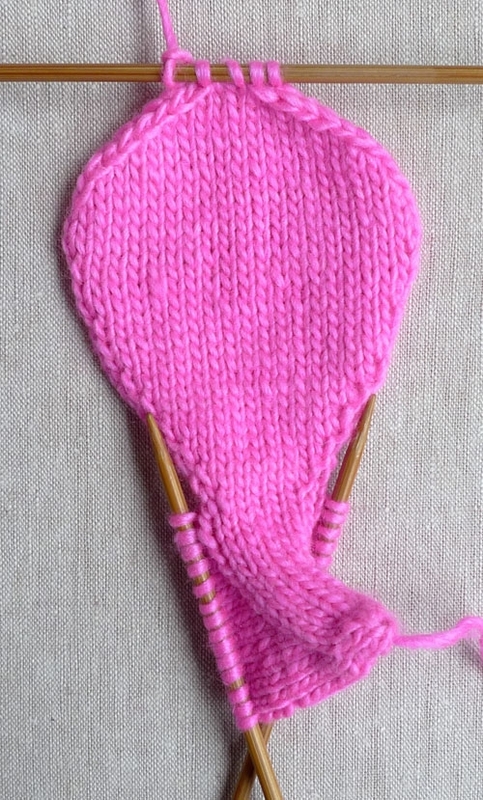 You are holding the body stitches on 3 needles, and you will need a fourth needle to knit with. You are still turning the work each row and therefore knitting with a wrong side and a right side, so you aren’t knitting in the round. Hope this helps! Hi, I am trying to make a “baby” hedgehog to go with the two regular sized parents. Can you suggest how to decrease the number of stitches so it will work with the pattern please? For a 3D object like this, I think the best thing to do is to use a smaller size yarn and smaller needles! Love this pattern. 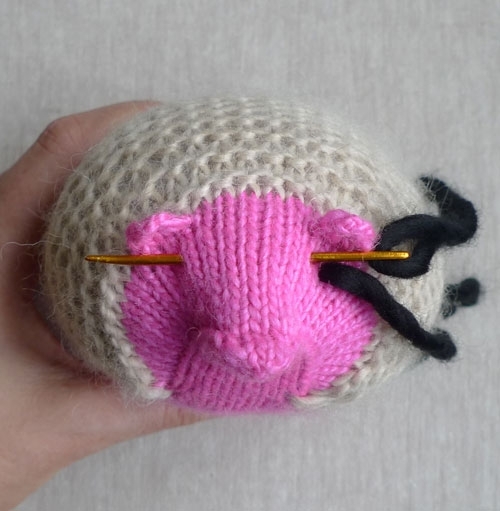 I noticed several folks on Ravelry have turned the head around so that the nose turns up which I must admit, is pretty darn cute. Can you offer instructions for doing this? We wouldn’t be able to write out specific instructions, unfortunately, but I can suggest that the folks on Ravelry must be doing this by changing the very first step of the “Belly.” I can only guess that they are working back and forth on the 7 stitches across from the Beginning of Round instead. 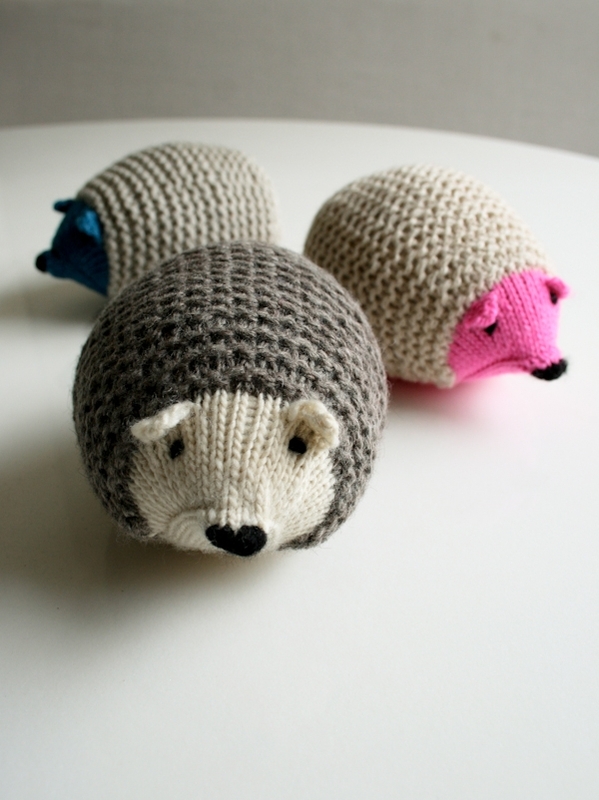 Can I get a crochet pattern for the Hedgehog ? Unfortunately we don’t have this in a crochet version. 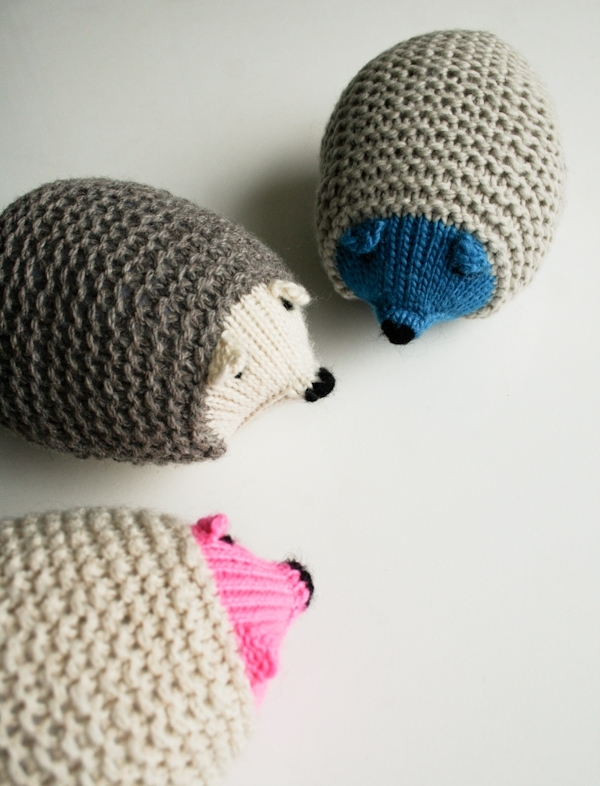 Maybe you could try to do a web search for a crocheted hedgehog pattern? Sorry we can’t be of more help. 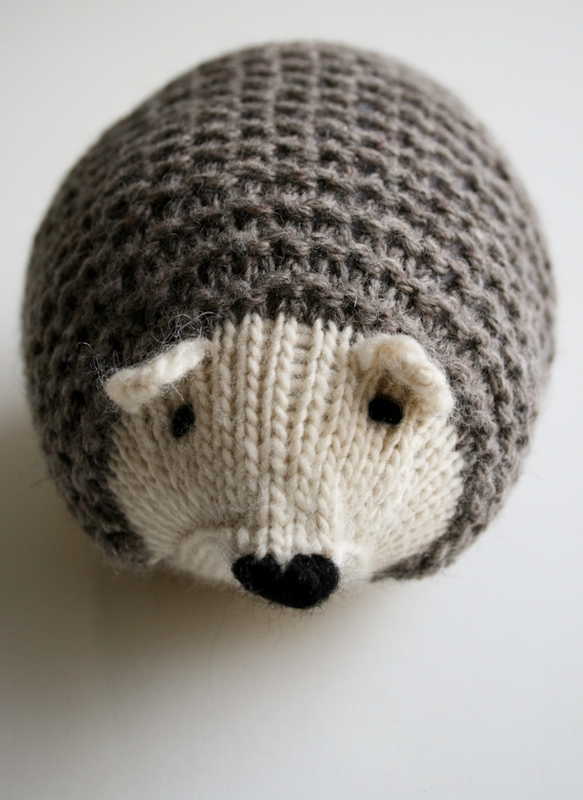 I came across this just in time to make one as a Christmas present for a friend who loves hedgehogs. I substituted a sparkly eyelash yarn for his back and was very pleased with how it came out. Thank you for sharing this pattern! I made several of these from leftover handspun of different weights, and I stuffed them with wool roving. Cats LOVE them. Thank you for the pattern and wonderful photo instructions. I hope to make this soon. I have unpicked the hedgehog twice now. As I knit I am left with a hole where the nose should be but in all your pictures, the nose is knitted over, there is no hole. What am I doing wrong pleas? Thank you for the comment! The nose is the very beginning of the pattern and is made with the 6 casted on stitches so I recommend trying to knit them as tight as possible to help close it up. Then at the end you stitch the black onto the nose with a tapestry needle so if there is a hole there you can create the stitches in a way that close up the hole nicely. I hope this helps and feel free to write us back if you are still having trouble or if anything else comes up! Hedgehog, am I casting on 6 stitches in total, or 6 on each of 3 double pointed needles please? Thank you for the comment! You are casting on 6 stitches total and then dividing it amongst the 3 needle, so you will have 2 stitches on each needle. Feel free to respond if you have any other questions! I couldn’t quite figure out the first part of the pattern with the face. I felt like I was doing it right but it’s not turning out the way it should. Can you please help me? Starting a project on double pointed needles with so few stitches can be a little tricky because the needles want to wriggle around a whole lot. You may find it easier to work the first few rounds flat on just two needles and to join into the round a few rows later (once you’re finished, you’d have to sew a little seam to join those first few rows). Slip a third of the stitches onto a third needle and with the right side facing you, join to work in the round, starting with Round 4. I hope this helps! If not, please let us know exactly where you think you might be going wrong and we’ll try to sort it out. Thanks so much for your question and good luck! I figured it out on my own before I saw your response, but thanks so much anyways! I just got confused at round 5 because I didn’t realize that the m1r stitches were stitches at the end of the round, so I wasn’t knitting to the end of the round completely like the pattern said to. Also, I modified this pattern a little bit so that the head was upside-down because I thought that it looked cuter, and I also added feet to it. Thanks again, and thanks so much for this wonderful pattern! Sounds adorable! I’m so glad it worked out for you! Loved the story and the photos. The directions that appear with this pattern are quite clear. However, the printout is confusing (and I am an experienced knitter) because it does not reflect the simplicity of the design that I read on the screen. I am faced with the reference to a site that explains a stitch, etc. So I just hand copied the original. If youâ€™re on a desktop version of the site, you will find a â€œprintâ€ icon in the right column just below the date and tags. If youâ€™re on a mobile version of the site, you will find a â€œprintâ€ icon below the pattern and above the comments. Follow the easy on-screen instructions to delete whichever parts of the pattern you donâ€™t want to print or save. For example, you may decide to shorten the pattern by omitting certain images or the list of materials. 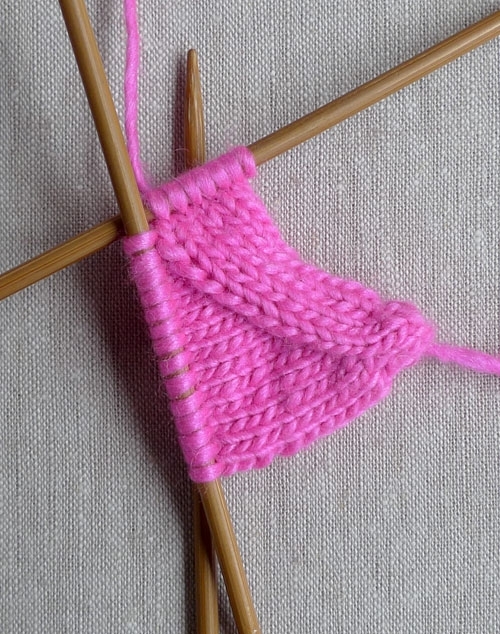 Hi, does casting 6 stitches onto 3 kneedles mean 6 each or 6 between the three needles? I’m a still a novice knitter, so I’m still looking up a lot of the techniques you mention. 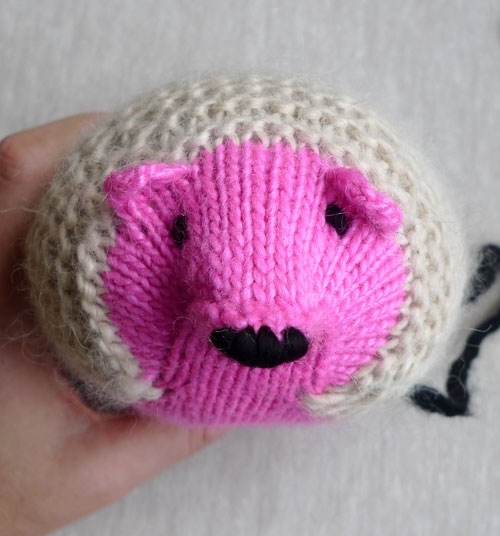 But I really want to make this as a gift for a hedgehog owner, and I’ve got the belly done, so I’m not giving up! I’m a little confused when it comes to starting the body. I’ve only ever done basic things like scarves and a hats, and this is my first time trying a pattern that involves picking up stitches and knitting onto edges. I apologize for the lengthy comment. Appreciate your help! Thank you so much for writing in and sorry for the very delayed response! It sounds like you’re on the right track! For the body you will be working back and forth on the 29 Head stitches that have been on hold. So, with the right side facing you and using the Main Yarn and the larger double pointed needles, knit 29 stitches onto three needles (it sounds like you’ve got this part). For Row 1 you’ll knit along those 29 stitches. 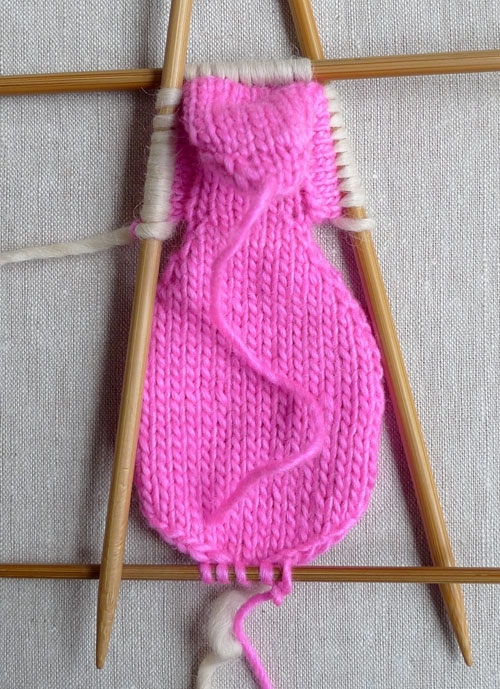 So, for row 1 you’ll knit 27 stitches then you ssk, k1 and then you pick up 1 stitch knitwise from the Belly (remember that when you are picking up stitches from the Belly selvages you should be picking up every other row – we’ve got a picture of what this looks like in the pattern). So, essentially you’re knitiing around the head picking up stitches along the body as you go. If you have further questions please let us know! I love this pattern! Thanks so much for sharing it. The hedgehogs have such sweet little faces, which I think are the most crucial part of any handmade little animal. I also appreciate the way you write patterns–it seems very logical and efficient to me, and I really enjoyed knitting a few of these little guys! Thank you for the feet idea! You saved me! I was trying to make little circle feet that look terrible. The ear/foot worked great! THANKS! Is there a PDF download for this pattern? Thank you. Thanks for writing in! You certainly can download a PDF of this pattern. If you’re on a desktop version of the site, you will find a “print” icon in the right column just below the date and tags. If you’re on a mobile version of the site, you will find a “print” icon below the pattern and above the comments. Just made an adorable hedgehog, and want to make a larger one. Do you think I could just double the yarns I used and increase the needle size? Thanks for writing in! This is a great idea. All you have to do is double the yarn and up the needle size. You could also just use thicker yarns. Good luck! Thanks for writing us! If you want to download a PDF, simply click the print button on the right side of the screen and you can click PDF in the pop-up window. There you can also print and email the pattern to yourself. Thanks again! Any way to modify the pattern to double the size. I’d love to make a small children’s pillow for the car or plane. Thank you for writing in! 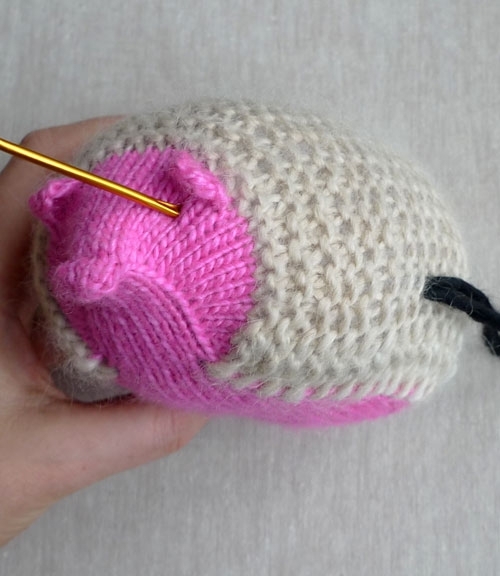 To make a larger hedgehog you can double the yarn and up the needle size. You could also use thicker yarn. Best of luck! quick question: I can’t find on the pattern how to make the tail? Thanks for writing in! This lovely little pattern does not have a tail for the hedgehog. Hi! Love this pattern! If I wanted to size it up, what would be the best way to pick needles sizes? Should I double the smaller size or just go up by multiples of 4? Like, if I use a size 8 for the belly, would I use a size 16 for the back? Or a size 12? I would obviously size up the yarn as well. Thanks for writing in! It all depends on the yarn you choose. I would definitely pick a bulky weight yarn for the back and a worsted for the belly. The needle size you choose all depends on the yarn because different yarns require different needles. Best of luck and happy knitting! 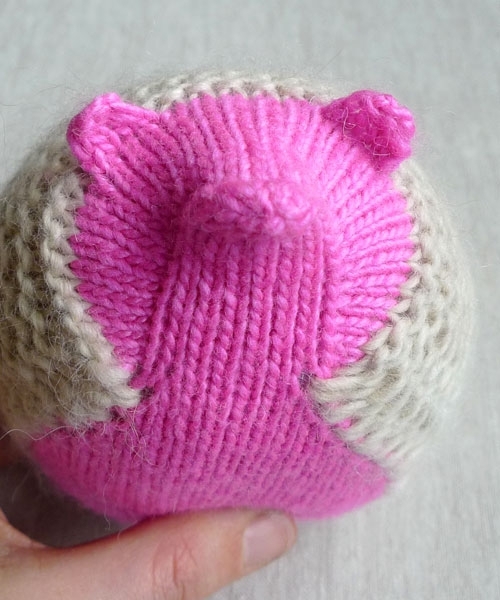 I looove this pattern and have begun adapting it – the first on my list was a little pink pig! I just changed the snout & added a knotted I-cord tail – adorbs! Thank you for this cool pattern, I love it!